At MadAboutFlags we really are mad about flags and offer you a huge range of high quality items for buying flags online. We have enamel badges, button badges, embroidered patches, car flags, desk/table flags, hand flags, large flags, football flags, keyrings, fridge magnets, bunting, cufflinks and mouse mats. Whether it's flags for home, for business, for collecting, for advertising your travels or for demonstrating your national allegiance we are your number one choice for country flags of the world and more. Any questions, just call us or drop us a note at info@madaboutflags.co.uk. We look forward to hearing from you. Welcome to Mad About Flags, where you will find one of the largest selections of flags and accessories online. Whether you are looking for a Union Jack flag or want to support your local sports team our collection is unbeatable. Browse our superb selection online at your leisure. With over 200 enamel flag badges, 250 button badges and hundreds of embroidered patches in up to 9 different styles our choice is unbeatable, whether you are a collector, an enthusiast or just like to show your friends where you have visited. Check out our large polyester flags - huge range of country flags of the world, county flags, checkered flags, football flags, sporting flags, gay pride flags, military flags, pirate flags and historical flags. How about a birthday flag to brighten up that important day. Our large flags are ideal for sporting events and for festivals; in fact for any occasion you choose to celebrate. We have flag bunting and hand waving flags too. For your car we have an extensive range of car flags. Great for showing support during the major sporting world cup tournaments, whether it's football, cricket or rugby. Is your desk at work looking a touch dull? Then brighten it up with one of our desk flags or very stylish mouse mats. Desk / Table flags are great too for conferences, for business meetings or global events. For that more personal touch we have cufflinks available for 30 different countries and counties. Stylish and attractive they are suitable for a range of occasions. Our cufflinks also make lovely gifts as they come displayed in a presentation box. Here at Mad About Flags, we share your passion for flags and can offer you the best selection at the best price. Our flags are perfect for those who require powerful promotional tools and those who wish to demonstrate their national allegiance. Our collection of National flags includes the St George, St Andrews and the Union Jack flag. Here at Mad About Flags, we strive to offer our loyal customers an unbeatable service in terms of quality and price. We use the latest technology to bring you high quality flags at the lowest price. Shopping online for flags and accessories has never been easier. Simply select your chosen products and add them to your virtual shopping basket. 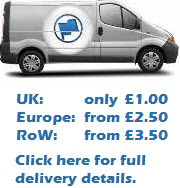 Once you have paid via our secure system, relax and let us deliver your order direct to your door at speed. We strive to provide our customers with a hassle free shopping experience. We update our stock regularly, come back soon to discover our latest additions to our coveted collection. All our items are stocked on our premises so we can dispatch as quickly as possible, either same day or next day using first class post or airmail. Delivery charges are fixed per region. Should you have any questions please drop us a note at info@madaboutflags.co.uk. For our latest updates subscribe to our newsletter, join us on Facebook or follow us on Twitter. To see what's changed in the world of flags check out our new Flag News section to the left and to find out what we have planned have a look at In the Pipeline.